Three Sneezes in a Row—what could a picture book with that title be about? Cassie Kitzmiller has you guessing from the beginning. Ten sounds that you can hear coming from your body are shared with the reader through a counting poem and action verb after action verb and rhyme after rhyme. What part of your body cracks, creaks, rolls, dips, bumps, toots, blinks, and grumbles? The characters’ faces on each page are laughable in themselves. The surprise ending is the one that will set the reader off into more laughter and, of course, after reading Three Sneezes in a Row all the way through, it’s the one sound everyone has probably been waiting for. Wait until you see what the last sound leads to! 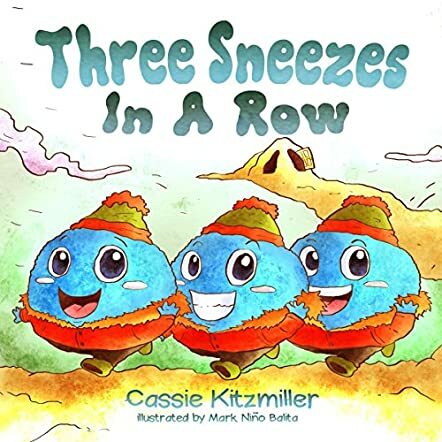 Oh, the joy of finding Cassie Kitzmiller’s book Three Sneezes in a Row! Sounds the body makes are highlighted in a cute counting poem that children of all ages will love. Even the adult children in us. What a fun way to teach children counting, action verbs, rhyming words, and body functions, all rolled up in one adorable package. The illustrator, Mark Nino Balita, provides a colorful background to this already action packed picture book. Mark has offered views of the body one doesn’t expect to see. If you want to share a laugh with your children, here’s the book. If you want a cute teaching resource for a variety of learner goals, Three Sneezes in a Row provides that too. I highly recommend this book for both parents and teachers.